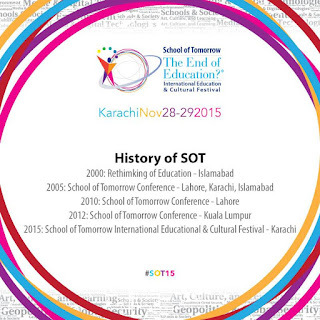 The Social Kaleidoscope: School of Tomorrow (#SOT15) – What’s in it For You? School of Tomorrow (#SOT15) – What’s in it For You? With 40 years of excellence in education in Pakistan, Beaconhouse is all set to organize a one-of-its-kind educational and cultural festival on the 28th and 29th of November at Beach Luxury Hotel in Karachi. Initiated as an endeavor to shed light on the current status of education in the country and to redefine it, the School of Tomorrow (SOT) Conference is one of the very first International Education and Cultural Festival in Pakistan. Spanning across a period of two days, the event will be graced by some of the distinguished experts and renowned thinkers in Pakistan and from various parts of the globe who will be delivering a series of essays and presentations on a wide variety of topics. Be it an understanding of a child’s psychology or an issue revolving around digital safety and concerns, a story about massive cultural invasion or an in-depth study about arts, it is the broad spectrum of topics being chosen that has piqued my interest in attending this conference. The School of Tomorrow (SOT) conference is a free-of-cost public event allowing accessibility to all and sundry; however, registration is compulsory for attending all the exclusive sessions at #SOT15. Here’s the link to its online registration form. 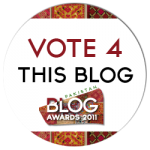 Over all these years, Beaconhouse has not only been excelling in providing productive and meaningful education to children but it has also remained conscious of its role as a socially aware organization and has supported the community and contributed generously in times of national crisis through various activities and organizing the School of Tomorrow (SOT) conference comes under the same umbrella. 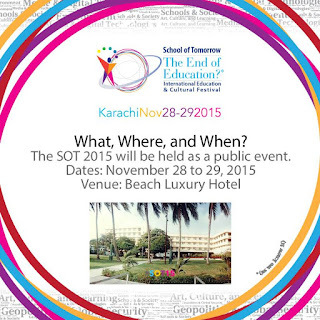 Come forward and be a part of the Educational Evolution as Beaconhouse takes the lead through #SOT15.